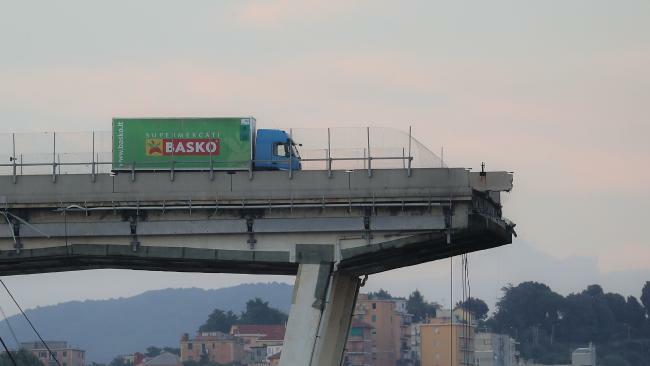 AMONG the visions of destruction from the 'apocalyptic' bridge collapse in Italy, a lucky truckie has emerged as the poster image of the tragedy as he lingers mere metres away from the brink of death. 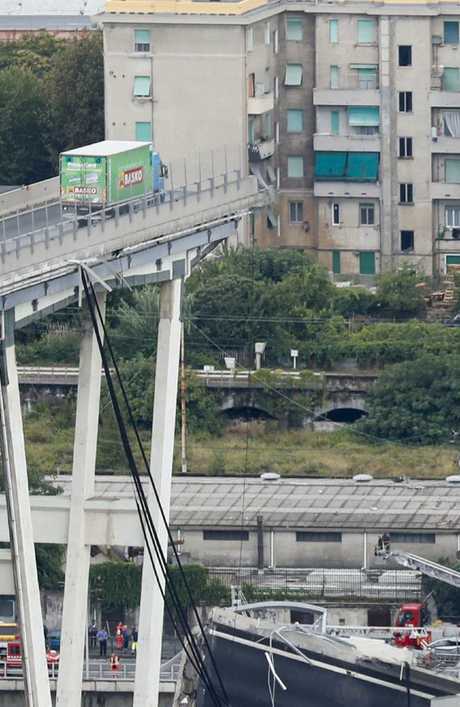 On Tuesday, 80 metres of the 50-year-old Morandi bridge in Genoa collapsed and sent vehicles plunging 45 metres into a heap of rubble, with 22 people pronounced dead so far. But one picture of survival has stunned the world, showing a green delivery truck stopping along a rain-soaked stretch of what remained of the highway. Ahead of the world's luckiest trucker - who remains unidentified - was an abyss of twisted metal and concrete left behind when the bustling motorway suddenly gave way during a violent rainstorm around 11.30am local time (7.30pm AEST). Hundreds of firefighters and emergency rescue officials are racing against time to find survivors in the rubble. Cars fell with tonnes of twisted steel and concrete debris into a nearby river, railroad tracks and an industrial zone below. Unidentified fire brigade sources had earlier told Italy's ANSA news agency that as many as 35 people were killed. 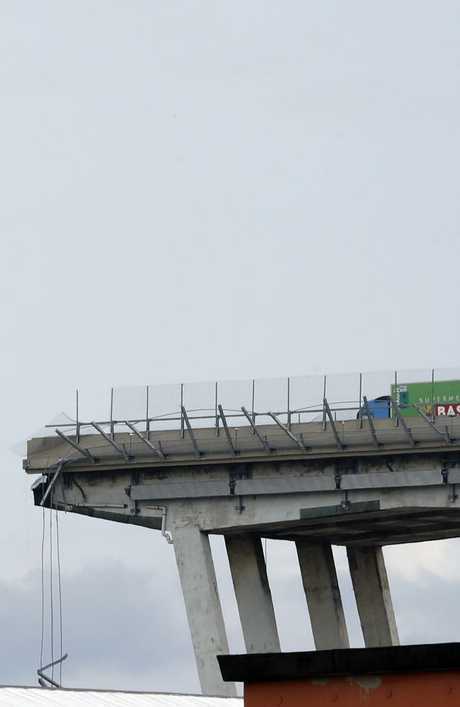 Italy's leader Premier Giuseppe Conte travelled to the site of the disaster this morning saying "it is shocking to see the twisted metal and the bridge collapsed with victims who were extracted". 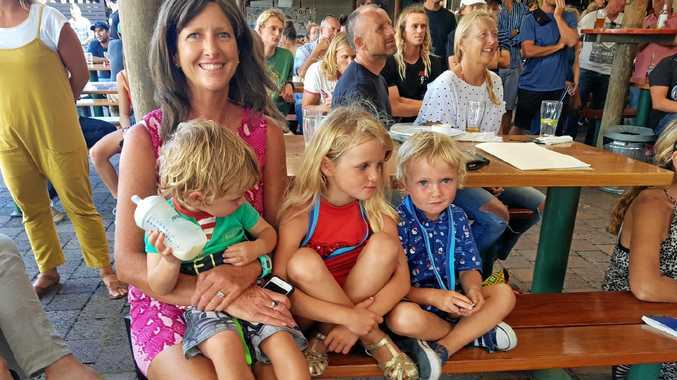 He also praised the hundreds of rescue workers still at the site, saying "they saved people who fell 45 metres and are now alive and in the hospital". Photos and video footage of the incident have emerged, showing the devastating aftermath which has left the northern port city reeling, and the world stunned. Witnesses have likened the scene of the horrific accident - the deadliest of its kind in Europe since 2001 - to an apocalypse.